Below you’ll find a list of the Porpoise team's favourite sustainability tips. When put in place these actions can be good for both your wallet and the planet! At Porpoise, we love to #CelebrateTheGood. This year for International Women's Day, we wanted to provide a few tips for how you can foster a workplace that promotes equality and inclusion. Below you will find 7 tips as well as a few examples of companies that are leading the charge. We encourage you to join the conversation and celebrate women’s achievement, and support companies that are raising awareness against bias and taking action for equality! As we all know, the stats on employee engagement are discouragingly low. We know these statistics because companies are doing a great job of surveying employees, asking them how engaged they are. Until recently, thats what people considered to be managing employee engagement. For many people, when they think about Corporate Social Responsibility, they imagine cutting cheques to charities and volunteering time for various causes in the community. These are certainly two important and impactful aspects of CSR, but for many companies their Corporate Social Responsibility programs take on a much broader scope. At Porpoise we think of CSR as a company’s responsibility not only to communities and the environment, but to their employees as well. Companies have a responsibility to put policies and processes in place that put purpose into action, and foster environments that are conducive to positive change. Porpoise is built around what we call challenges. A challenge usually has a goal and a corresponding metric and end date associated with it. Challenges follow the SMART goal framework, meaning they are specific, measurable attainable, realistic, and time bound. For example, a volunteering challenge could have a goal of achieving 10 hours of volunteerism in a 3 month period. This makes it easier for people to understand what they are working toward, and how they can contribute. Just one of the many contributing factors to our user-experience. 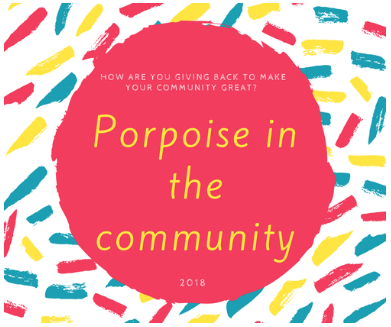 For International Volunteer Day we wanted to highlight a Porpoise client that has been going above and beyond in their community. When we met with Leading Edge Credit Union for the first time, one thing struck us immediately-as an organization they were investing a ton of their time (both personal and company time), and other resources back into the community.